Corbin Bleu danced a Argentine Tango, on tonight’s episode 8 of Dancing with the Stars for a dance style she had not previously performed. Check out Corbin’s DWTS bio [CLICK HERE. If you missed tonight’s show you can read a full and detailed recap, right here. The seven remaining couples will compete in two rounds of dance. In the first round, each couple will take on a dance style they have not previously performed including the Tango, Argentine Tango, Contemporary, Viennese Waltz, Jazz, Disco, and Foxtrot. The couple to receive the highest total score from the judges in this round will receive immunity and not be subject to elimination. In the second round, the six remaining couples will compete in a thrilling head-to-head “dance off” competition. The winning couples of the “dance off” round will be awarded additional Judges’ points that will be added to their overall score for the night. On last week’s show Corbin was given a 29/30 for his Cha Cha Cha. Len said about his performance, “Lovely, crisp footwork, nice legwork, I am not a fan of the gyrating. For me gyrating comes between rap music and a baby crying. But I thought you did an excellent cha cha.” If you missed any of last week’s performances, you can check out all the videos, right HERE. 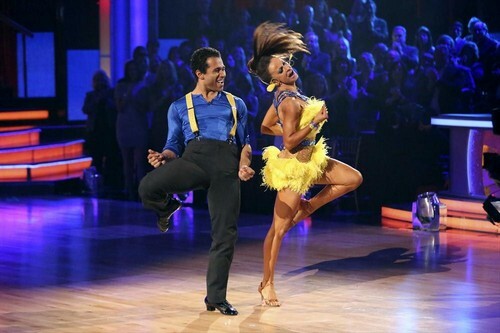 Corbin Bleu and professional dancer Karina Smirnoff: dancing an Argentine Tango. Corbin did not say much about his dance this week but he did thank all his fans for their support. SCORES: Carrie Ann: 9 Cher: 9 Bruno: 9 TOTAL: 27/30 – Vote for Corbin Bleu and professional dancer Karina Smirnoff: at Voting #: 1-800-868-3406.